At the IV Corps’ northern flank, the units of an enemy rifle corps advanced towards Ilomantsi and Tolvajärvi in the first days of December. Group Talvela, which was subordinate to the General Headquarters, was concentrated in the area and subsequently stopped the enemy’s attacks in both Ilomantsi and Tolvajärvi. The group launched counterattacks in both areas. In Tolvajärvi, Detachment P defeated an enemy rifle division on 12 December. The detachment reached Ägläjärvi on 17 December, occupying it after battles on 22 December. The following day, the attacking force advanced to the Aittojoki River, where the front lines stabilised until the end of the war. Edited map from the work Ari Raunio – Juri Kilin, Talvisodan taisteluja (Battles of the Winter War). 3rd edition. Karttakeskus 2010. A rifle corps (1st RC) commanded by Brigade Commander Roman I. Panin attacked on the northern flank of the Soviet 8th Army, which had attacked in the areas of Ladoga Karelia, Border Karelia and Northern Karelia north of Lake Ladoga. One of its two rifle divisions (155th RD) attacked towards Ilomantsi, while the other (139th RD) attacked towards Tolvajärvi. The division that attacked towards Tolvajärvi was commanded by Brigade Commander Nikolay I. Belyaev. The vanguard of his rifle division fought on the east side of Tolvajärvi on 6 December. Division Commander Dmitry T. Kozlov was appointed the rifle corps’ new commander on 23 December. The troops of Detachment Räsänen had started to withdraw from the Suojärvi (Suoyarvi) area, with one separate battalion heading towards Tolvajärvi and another towards Ilomantsi. At first, a separate battalion (11th SepBn) fought in the Ilomantsi area. One battalion from the Field Reinforcement Brigade (XIII/FRBde) was deployed to the area as reinforcements. The forces in the Tolvajärvi area were reinforced with two battalions and other units during the delaying battles. Having resigned from the Defence Forces in 1930, Jaeger Officer, Colonel Paavo Talvela was called to service during the additional refresher training. He served as deputy chief of staff (logistics and armaments) in the Ministry of Defence and as chief of staff of the Armament Council. The commander-in-chief, Field Marshal Mannerheim, ordered Talvela to report at the General Headquarters in Mikkeli on 6 December 1939. There, he was assigned a mission. The detachment established under Talvela’s command was to defeat the enemy forces heading towards Korpiselkä and Ilomantsi and from there advance towards Suojärvi. The General Headquarters intended to retake the Suojärvi area with Detachment Talvela and the IV Corps. Detachment Talvela was later renamed Group T.
More troops were subordinated to Group Talvela, which was under the direct command of the General Headquarters. The troops in the Ilomantsi area were formed into Detachment A, while the troops in the Tolvajärvi area were formed into Detachment P.
Defenders of Ilomantsi from Jalasjärvi in winter 1940. SA-kuva. Three battalions and a mortar company from the Field Reinforcement Brigade were headed for the Ilomantsi area to serve as reinforcements in Detachment Talvela. Jaeger Officer, Colonel Per (Pelle) Ekholm was appointed commander of Detachment A, which was formed of all the troops in this area. When Talvela took charge of the front in the Ilomantsi area, battles were being fought in the areas of Möhkö and the Kallioniemi ferry. The commander of Detachment A, Colonel Ekholm, arrived in Ilomantsi on 8 December. The following day, he gave the troops battling in the Möhkö area permission to retreat to Oinaansalmi. The units of the enemy division also attacked in the Kallioniemi area on 10 December. The enemy forces that had partly reached the defenders’ rear were repelled. The counterattack started by Detachment A did not achieve significant success. The front in the Ilomantsi area stabilised at the Kallioniemi–Oinaansalmi line. Detachment P launched its attack in Tolvajärvi on the morning of 12 December. Belyaev’s rifle division (139th RD), which was preparing its own attack at the same time, began its withdrawal after the day’s battles. For a time, the division was almost incapable of battle. Concentrated at the front in the withdrawal phase after the Battle of Tolvajärvi, the 75th Rifle Division took over the responsibility for the front from the 139th Rifle Division. Detachment P reached Ägläjärvi four days later, on 17 December. The majority of the 75th Rifle Division and the troops of the 139th Rifle Division who were fit to fight took up defensive positions there. The fighting in Ägläjärvi lasted for five days. The troops of Detachment P occupied it on 22 December. The following day, the detachment’s offensive stopped at the enemy’s defensive positions at Aittojoki, where the General Headquarters stopped the offensive. The front lines stabilised at this line until the end of the war. 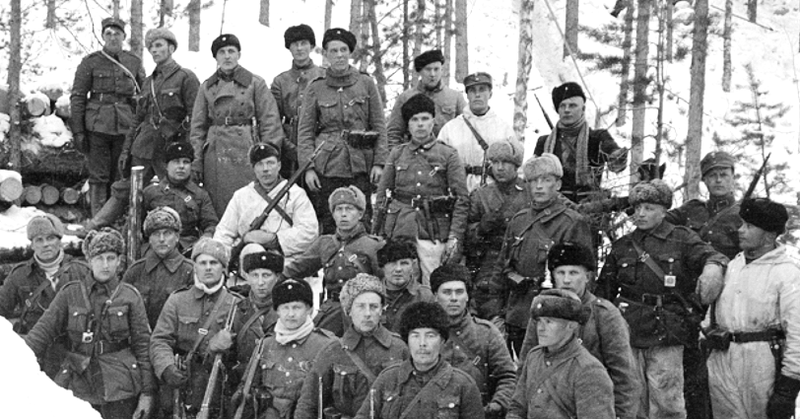 According to the statements of the Soviet rifle divisions that participated in the Battles of Tolvajärvi and Ägläjärvi, they suffered the loss of 6,490 men in the first month of the Winter War (30 November 1939−1 January 1940). The 139th Rifle Division lost 3,552 men, of whom 761 were killed in action, 1,715 were wounded and 1,076 were missing in action. The 75th Rifle Division lost 2,938 men, of whom 747 were killed in action, 957 were wounded and 1,234 were missing in action. According to the database ‘Finnish War Victims in the Second World War’ in the National Archives of Finland, a total of 517 men from Detachment P were killed in action between 30 November and 31 December 1939. The majority of these fatalities, 412 men, were from the 16th Infantry Regiment, which comprised three battalions and the regiment’s other troops. The 112th Separate Battalion (112th SepBn) lost 49 men, the 7th Bicycle Battalion 34, the 10th Separate Battalion 10, the 9th Separate Battalion 6 and the III Artillery Battalion of the 6th Field Artillery Regiment (III/FAR 6). According to Detachment P’s own statement, its casualties in the Battle of Ägläjärvi between 17 and 23 December 1939 totalled 748 men, of whom 274 were killed in action, 445 were wounded and 29 were missing in action.